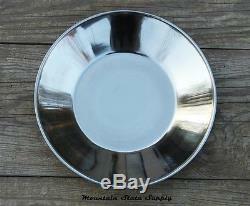 Civil War Reenactors Soldier's Army Dinner Plate Camp Mess Stainless Steel Dish. Reproduction Civil War mess dish. Made of stainless steel for rust free use. 6 3/4" wide in the bottom, 9 3/4" wide edge to edge. The item "Civil War Reenactors Soldier's Army Dinner Plate Camp Mess Stainless Steel Dish" is in sale since Thursday, April 02, 2015. This item is in the category "Collectibles\Militaria\Civil War (1861-65)\Reenactment & Reproductions\Other Civil War Reproductions". The seller is "mountainstatesupply" and is located in Ripley, West Virginia. This item can be shipped worldwide.